Saw a demonstration of the gradient color feature in the new scal and thought that it would be nice to have this as well in MTC. I do a lot of print and cuts and having this color effect would be really nice. Also a preset of different textures such as stripes or chevrons would be also nice to have for different fill options. MTC does have a gradient feature (refer to the section part of Section 8.13). Or is this something different in SCAL? And yes, stripes, chevrons, and other popular patterns would be a nice addition. @SandyMcC I have used the nested duplicates and color "gradients" before Sandy to create raster images, but the scal version is different and you do not have to make the inset shadows, it works sort of like a color wand, to fill the single shape with a gradient of color of different hues that can be changed with very easily to different color combinations. Maybe technically it is doing it the same thing in the background and then creating a texture snapshot, but with much less steps and without your computer crashing. 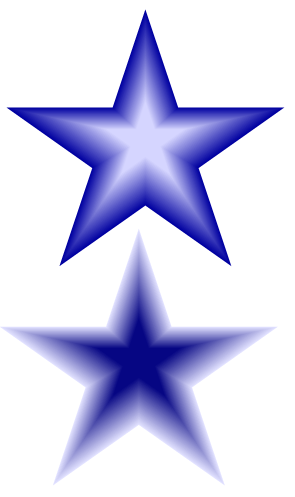 Recently I wanted some gradient stars and I just placed a star on the mat and used nested duplicate with 1mm gap and voila I had some nice gradient stars to print from within MTC. I just told MTC that I wanted to start with either light blue or dark blue and finish with the opposite. For my purposes it worked very nicely. I think the gradient in scal doesn't have to be symmetrical thru the shape as you get with nested duplicate- can start at one end and advance to the other - giving a type of holographic effect - not certain it was just a demonstration and I do not own the software. I figured out how to do the gradient effect in make the cut!, as you see in the circle on the left. It was a 2 step process. It still would be nice to do this automatically. Make the Cut! rocks. 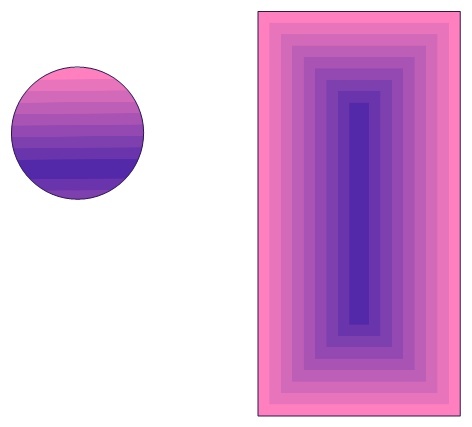 @leslie6111 I do know what you mean by having a button or buttons to make gradients. That would be very nice. When I want to make a true gradient, I go to the softwares I have had for years and years, Printmaster or Printshop and use their gradient feature. I can export them from PM or PS as PNG's but gradients don't seem to import nicely into MTC. Or anyway, I haven't figured out how to import them into MTC.